I keep meaning to mention a really cool event that this blog is actually going to be a part of in 2017! 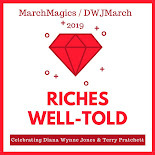 Bex of An Armchair By The Sea is hosting #Discworldathon through the entire year and I'm the March portion of it with #MarchMagics (and yes, #DWJMarch will still be happening as well ... don't worry!). Whether you're an afficionado, a total newbie or somewhere in between you're more than welcome to join at any point throughout the year. We have lots of fun bookish stuff in store for you and fellow bloggers will be hosting events throughout the year. If you'd be interested in hosting a readalong, themed month or anything else get in touch as there are a couple of hosting spots open still. January starts at her blog and the entire schedule for the year is up as well. The readalong book for the month is Wyrd Sisters. 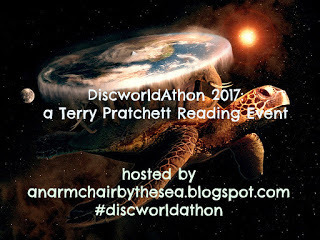 Oh boy, a whole year of Discworld? This will be fun! Another suggestion for March could be the Death series - I just read them and enjoyed them a lot. Thief of Time is one of my favorites of all. Ooh, you're right! Nobody seems to be doing Death and I've only read three of the five stories in the arc so I need to keep going. Great idea! There is a Hogfather readalong (in December, naturally) but the rest seem up for grabs. I think this is all solidifying in my mind. Plans are being formed!